Welcome to Spiaggia Lunga, a unique luxury camping site located near Santa Maria di Merino. Spiaggia Lunga enjoys a privileged location between the lush hills of Gargano National Park and the azure waters of the Adriatic Sea. With its golden sand beach and first-class amenities, Spiaggia Lunga is the perfect luxury camping destination. Advance bookings are available through Lux-Camp, so make sure you book your favourite spot at this fantastic luxury camping site for your next holiday. Why should I camp at Spiaggia Lunga, near Sana Maria di Merino? Camping Spiaggia Lunga offers a wide range of sports facilities: tennis and basketball courts, minigolf, and beach volley, as well as mountain bike and watersports equipment rental. Things to see and do in Santa Maria di MerinoSanta Maria is one of the best-kept secrets in southern Italy. Here you can take a boat trip along the stunning Adriatic coast, stopping at fishing villages and secluded coves. Signosted hiking and biking trails will take you to the most scenic viewpoints of Gargano National Park, and the nearby town of Vieste makes for the perfect day out with its charming cobblestone streets, thermal baths, and expansive beaches. 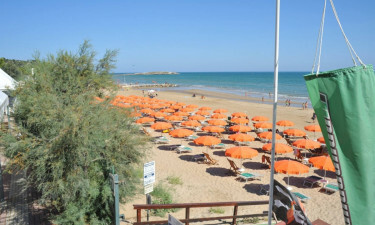 Restaurants, bars and entertainmentComplete your camping holiday at Spiaggia Lunga with a meal at the on-site restaurant, which serves the most delicious Pugliese cuisine and has a beautiful setting by the sea. Meals can also be ordered and advance and delivered to your luxury bungalow. Two bars serving exclusive cocktails and a lively discothèque complete guarantee that your evenings will be filled with fun entertainment.